The official opening of the photographic exhibition will be on Sunday 29th June at 3pm. Kevin Scott will be at the museum to open the exhibition and speak about this project — get your copy of the book signed by the photographer! AMRA have started sending the Branchline newsletter electronically to us, instead of by post, so I’ll upload them to this website from now on rather than printing them out: AMRA Branchline — June 2008. One advantage of getting it electronically is that all the pictures are in colour! This edition contains the wrap up from the Model Railway Show as well as an interesting snippet about sound equipped DCC locos. The issue of excessive noise levels in the club rooms as a result of the constant throbbing of sound equipped diesel locos, or the chuffing of steamers, has come up on a couple of occasions in our club. AMRA have obviously had the same issue as their committee has decided that sound equipped locos may only be run (with the sound on) in their clubrooms for a 10 minute period following each hour (i.e. from ‘o’clock’ to ‘ten past’, one sixth of the time). Remember the devastating bushfires around Dwellingup at the beginning of 2007? Thousands of hectares of bush were burnt out, and the Hotham Valley Tourist Railway was severely affected as every one of their timber trestle bridges was destroyed — as well as many drainage culverts and thousands of wooden sleepers. Restoration and rebuilding of the railway is proceeding well, and I was delighted to discover progress is being documented and photographed on‐line on the news pages on their web site. A link to the Hotham Valley Tourist Railway has been added to the links page. 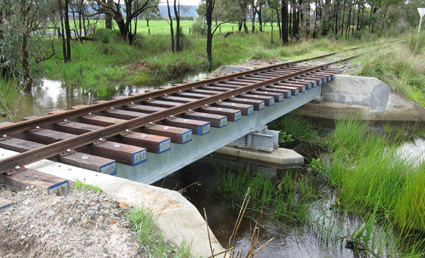 Image: The rebuilt 3km bridge on the Hotham Valley Tourist Railway after heavy rains at the beginning of June 2008 (from the HVTR web site). This entry was posted in AMRA, Exhibitions, Rail Heritage, Web site update by admin. Bookmark the permalink.